I’m really excited about this book. I bought a copy on Sunday after looking through it at the book store. I’m not normally a fan of books written by celebrities or of iconic music transformed into a blatant storytelling format (musical, movie, book). Maybe with the exception of Mamma Mia, but I love that purely for its ridiculousness. Those things aside, I liked this book. 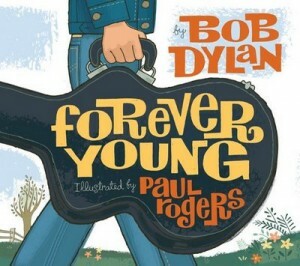 It’s straightforward, stylized in a way that is really appealing to me, and fills in historical figures of the time and references to Dylan songs without beating the reader over the head with them. It’s the kind of thing I would read to my own kids, if I had any, and that’s all this book needs to be. I don’t know if I would buy it for my school’s collection, but I wanted it in my own.